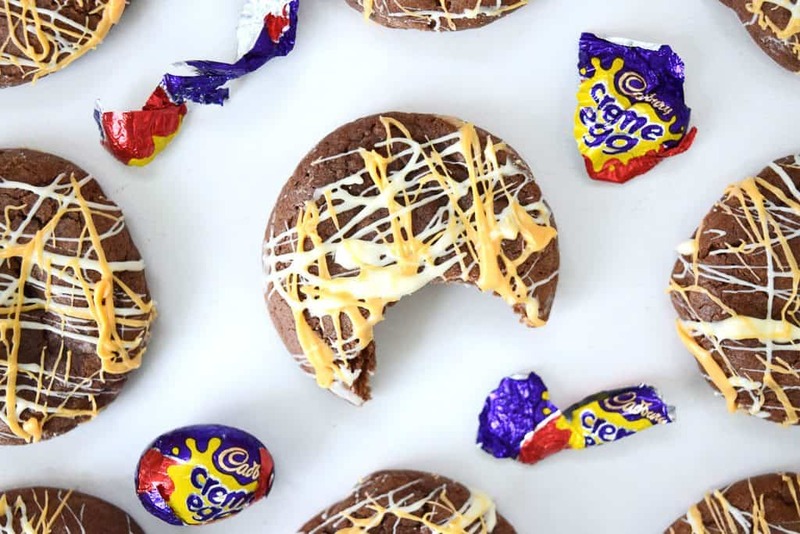 It’s Easter and a great excuse to fill my face with chocolate and Creme Eggs (who really needs an excuse!) and to make cookies! 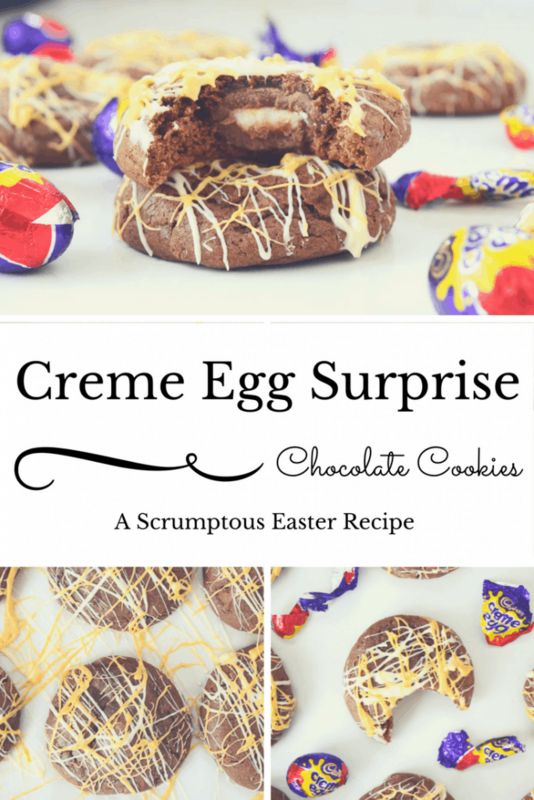 These Crème egg surprise chocolate cookies are out of this world amazing! So are you out and about enjoying the wonders of Easter this weekend? There are always so many great family days to be had at Easter and I for one, will be relishing as many as I can…. especially the chocolate! I know, I know, Easter isn’t meant to be about Chocolate, in fact, it’s far from it. But I won’t deny that, for me, chocolate is a wonderful addition to this holiday. The Easter weekend fills my mind with memories of family egg hunts in the garden. Racing around searching every nook of the garden for a special treat. Excitedly filling a little wicker basket to the brim. Such a lovely way to spend time with you family. I am yet to replicate those childhood memories with the boys, but this shall be the year I do. We may even extend the hunt further afield and go egg hunting in the woods. There are always so many delicious and imaginative recipes around at Easter and I always love the ones that feature Crème Eggs. They are, after all, only here for a small part of the year so you might as well make the most of them. The bad news is, that you will definitely miss these cookies for the rest of the year. So I suggest you get your fill of these indulgent cookies while you can. I am practically handing you an excuse to stuff your face this weekend on a (cookie filled) plate! This ooey gooey deliciousness is too much! I can’t resist. I am off now to dive into the rest of these before the boys realise there are any left! 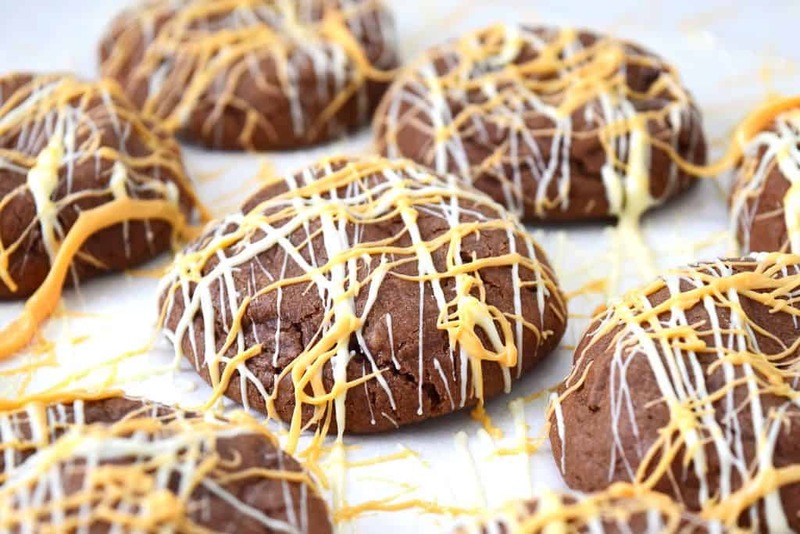 Head on over and check out this Chilli Lime Chocolate Cookie recipe now! 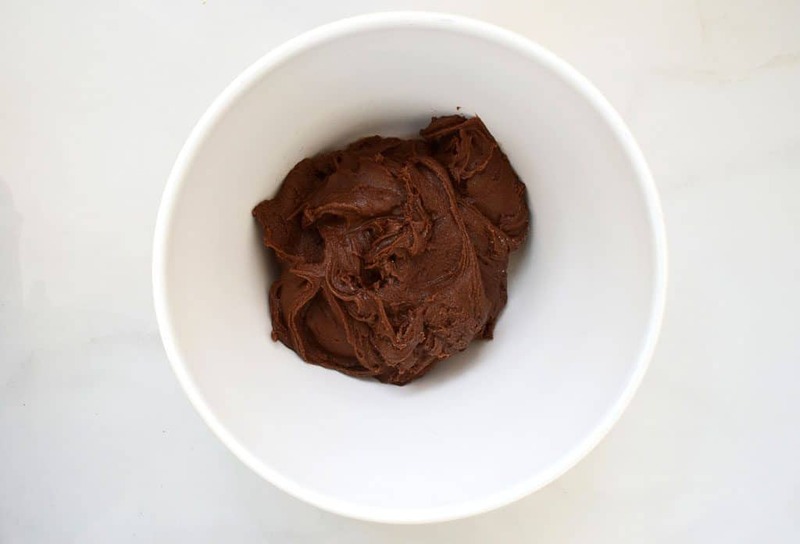 Sift the flour, baking powder and cocoa powder into the same bowl. Add the eggs and oil and mix to form a sticky dough. Cut the milk chocolate into chunks and mix through. Cover the bowl with clingfilm and place in the fridge, leave to firm up for about 30 minutes. Unwrap the mini eggs and envelope each one separately with a spoonful of the dough until the mini egg is covered. Roll each one into a golf ball sized ball and place on a lined baking tray, leaving room between each one to allow them to spread. Place in a preheated oven at 170oc (150oc fan assisted) for 12-15 minutes. Remove from the oven and allow to sit on the tray until they firm up a little. Once the cookies have cooled. Melt the white chocolate and divide into two separate bowls. 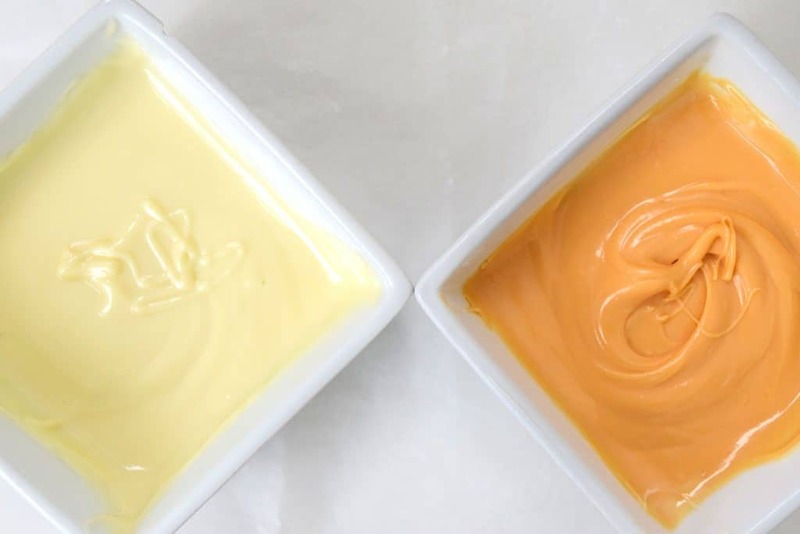 Add a little orange food colouring to one of the bowls and mix through. 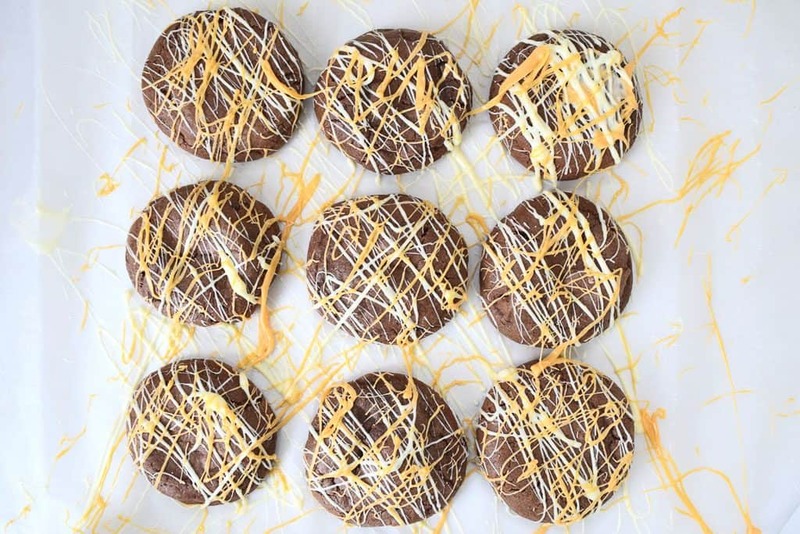 Using a fork, drizzle the twi different coloured melted chocolate over each cookie and allow to set before serving. These look amazing. Like, I-don’t-know-if-I-can-share-these-with-my-kids kind of amazing. Can’t wait to try them!